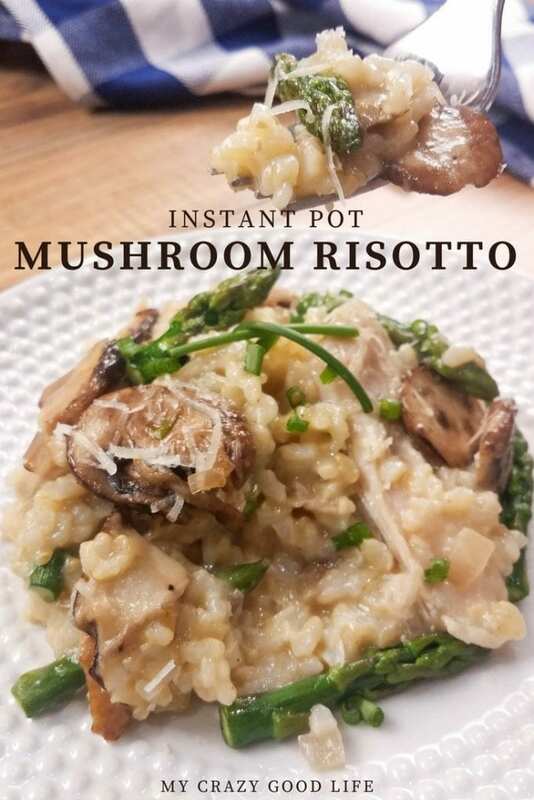 One of the most requested 21 Day Fix recipes for me has been this Instant Pot Risotto with mushrooms! Creamy and delicious, it’s the perfect 21 Day Fix Risotto side dish. The Weight Watchers Freestyle points have also been calculated for this dish, see below. It’s a pretty adaptable recipe, too, so you could swap the mushroom and asparagus with other veggies that you have on hand, as well. Sometimes it’s all about using what you have in your fridge. 1) Heat the olive oil while the Instant Pot is on sauté mode. 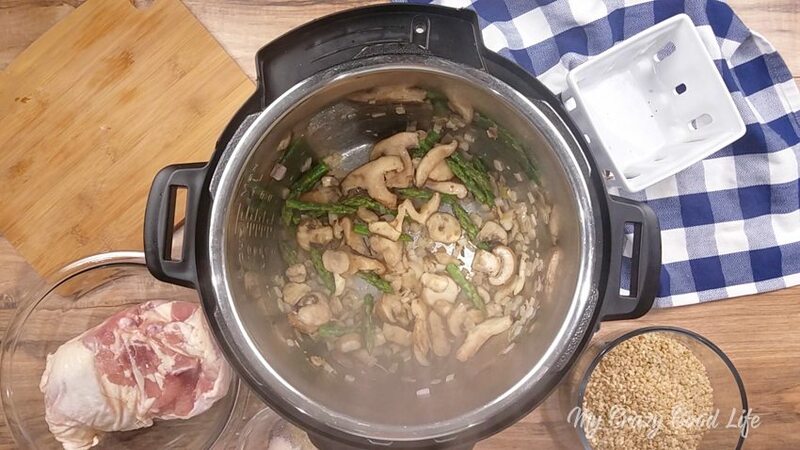 Add shallots, asparagus, and mushrooms. Sauté 2-3 minutes or until shallots are translucent. 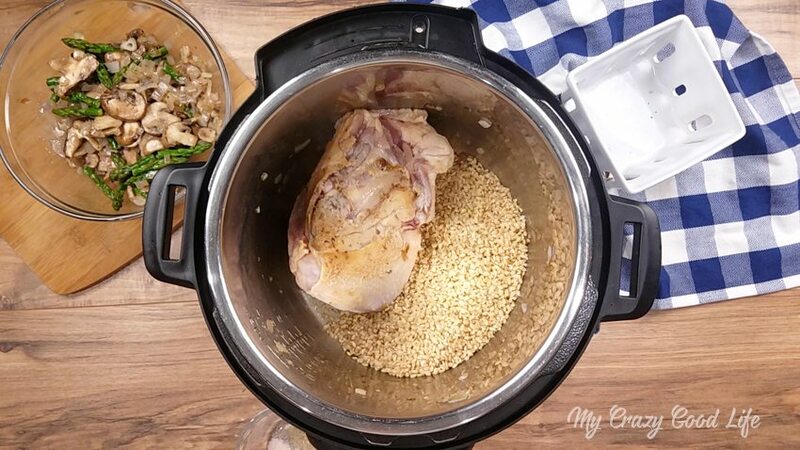 2) Remove vegetables from the Instant Pot, add the frozen chicken thighs and sear the outside of the meat. 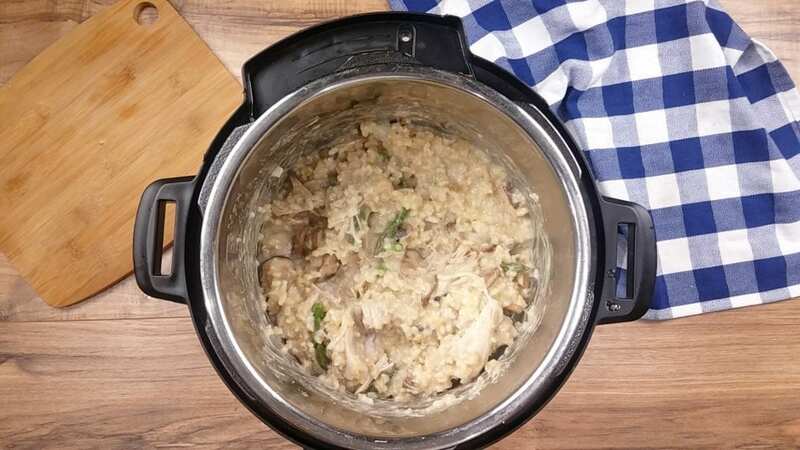 3) Add short grain brown rice, chicken stock, salt, and pepper. Lock the lid into place and turn venting valve to sealing. Cook on high pressure using the manual setting for 25 minutes. Let pressure release naturally. 4) Remove the chicken thighs to shred. Turn the Instant Pot to sauté and add chicken, vegetables, and parmesan cheese. Mix until cheese is melted and risotto thickens, between 2-5 minutes. Top with fresh parmesan cheese and enjoy! 21 Day Fix Risotto Container Counts: Makes 12 3/4C servings. Each serving = 1/2R, 1/6G, 1/2Y, and a negligible amount of blue (1/12 of a container). If you’re looking for a delicious 21 Day Fix Instant Pot recipe to pair this side with, check out my Cilantro Lime Drumsticks! Weight Watchers Freestyle Points: As the recipe states with chicken thighs, this recipe is 5 Weight Watchers freestyle points per 3/4C serving. Using boneless skinless chicken breast instead of the thighs makes this recipe 3.5 points per serving. 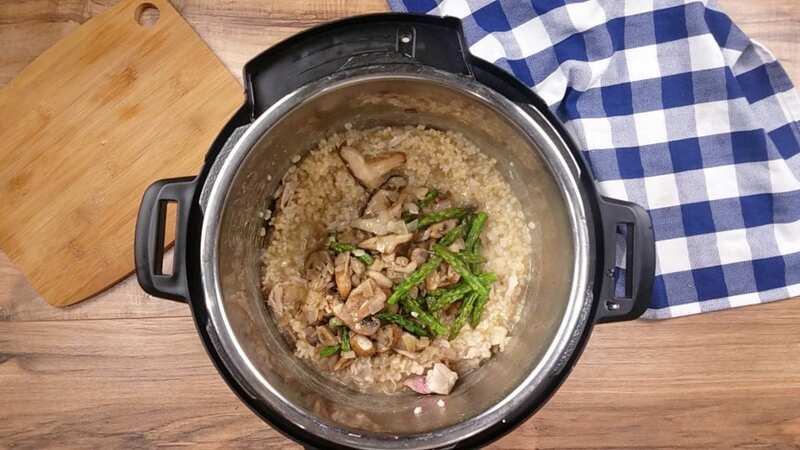 Using boneless skinless chicken and long grain brown rice, this recipe is 2 points per serving! 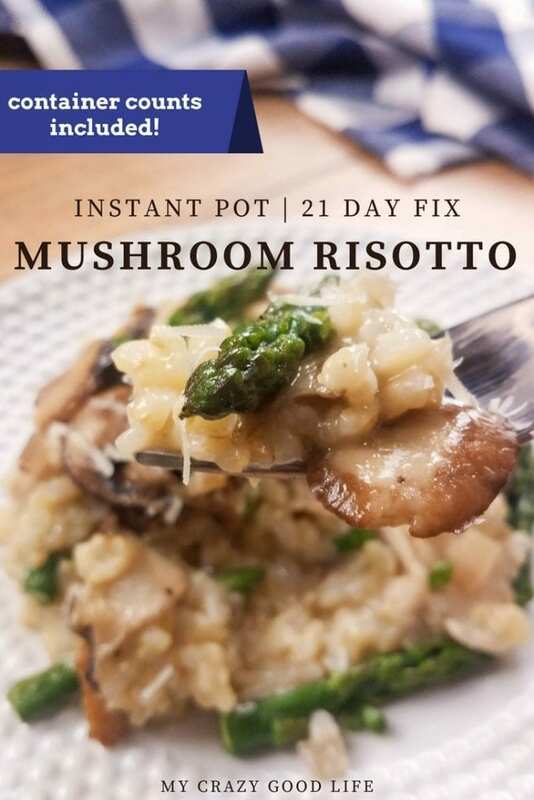 One of the most requested 21 Day Fix recipes for me has been this Instant Pot Risotto with mushrooms! 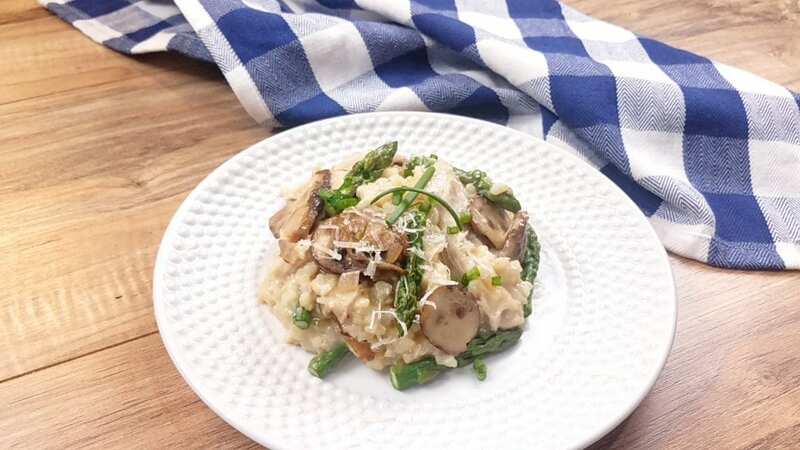 Creamy and delicious, it's the perfect 21 Day Fix Risotto side dish. 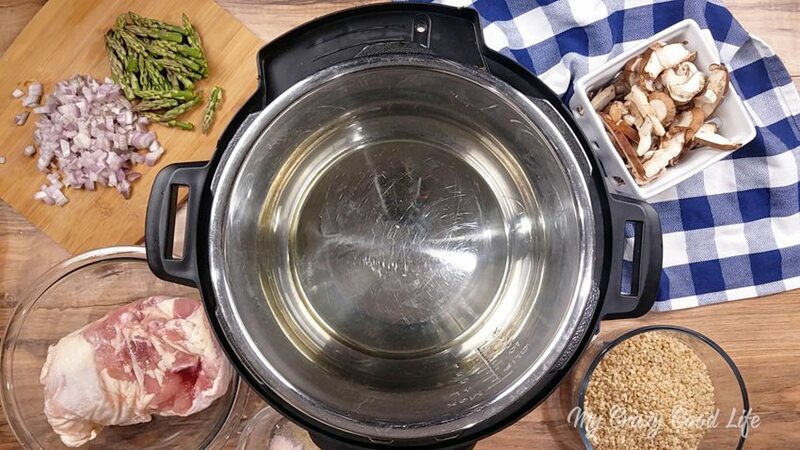 Heat the olive oil while the Instant Pot is on sauté mode. 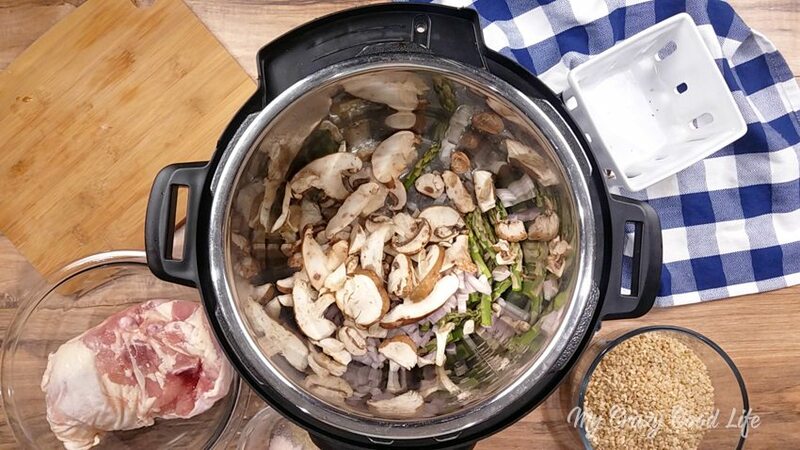 Add shallots, asparagus, and mushrooms. Sauté 2-3 minutes or until shallots are translucent. Remove vegetables from the Instant Pot, add the frozen chicken thighs and sear the outside of the meat. Add short grain brown rice, chicken stock, salt, and pepper. Lock the lid into place and turn venting valve to sealing. Cook on high pressure using the manual setting for 25 minutes. Let pressure release naturally. Remove the chicken thighs to shred. Turn the Instant Pot to sauté and add chicken, vegetables, and parmesan cheese. 21 Day Fix Container Counts: Makes 12 3/4C servings. Each serving = 1/2R, 1/6G, 1/2Y, and a negligible amount of blue (1/12 of a container). mushroom risotto is my favorite!!! i’m so excited about this recipe! SO yummy :) And filling! Can I use fresh/defrosted chicken thighs? If so, do I need to change the cooking time? 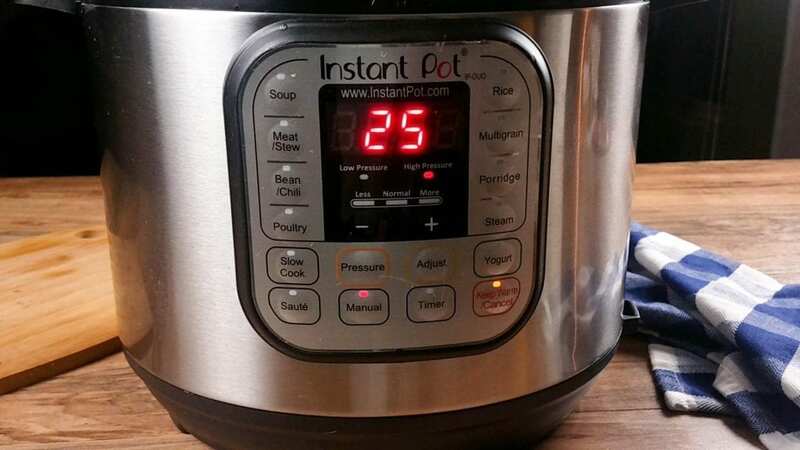 No change in cooking time, but your pot will probably come to pressure more quickly! This is such a great recipe! 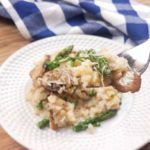 I absolutely love mushroom risotto! 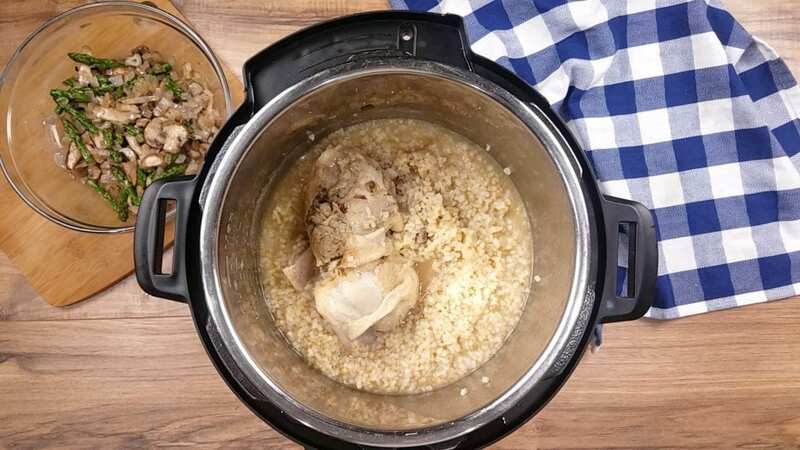 I don’t have an instant pot is there a way to make this without one? This looks delish! When you say ‘let pressure release manually’, do you mean to let the pressure come down naturally, or do you mean to use the quick release? Is this a recipe that can be reheated with out a disgusting outcome. Same time for frozen chicken breast? Same time, it’ll just take longer to come to pressure. This was delicious, and made a ton! I used long grain brown rice because that is what I had, and it turned out very well. It took way longer than I expected because the natural release took almost 40 minutes, but it was worth the wait! I’ll be making this one again! When I put this in the WW recipe builder, it comes out to almost 10 points a serving. Am I doing something wrong? I’m putting in raw rice as an ingredient, could that be doing it? I added it a few ways and explained the differences, I’m not sure what is different–are you using 12 servings?